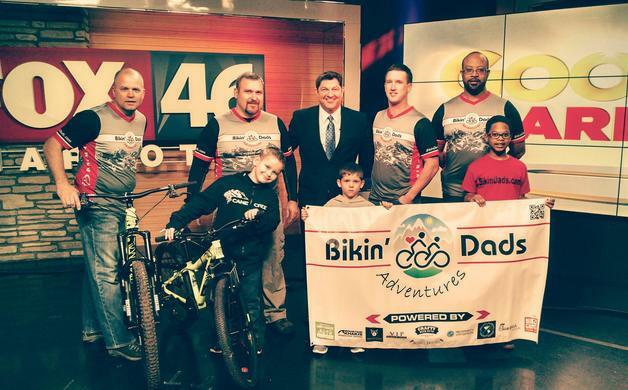 Bikin' Dads Adventures: "Building Stronger Relationships One Adventure at a Time"
Bikin' Dads Adventures is a nonprofit organization based in Concord, North Carolina that was founded in 2014. This unique organization was created with hopes to encourage all fathers to be more involved in the lives of their children and those around them. 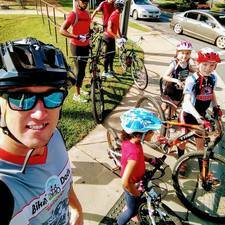 This program focuses on creating adventures for fathers and their children to encourage bonding, and most of these adventures are bike rides. Bikin' Dads also provides mentors and positive role model's for those with no father figure in their lives. To keep afloat, this nonprofit lives solely off of sponsors and donations. They are currently amidst a fundraiser now and are hoping that the Cabarrus County community will rally to help them reach their goal of $45,000. This money goes directly into their program, into their mentor programs, as well as their educational programs. Basically, it's a good cause all the way around! Founder Mark Gordon took some time to answer a few questions we had about this inspiring nonprofit, as well as tell us more about their current fundraiser. Tell us a little about Bikin' Dads Adventures. How did it get started? Bikin' Dads was founded in 2014 by myself and another Dad. We both shared some of the same passion for the outdoors and our kids. I came from a 15-year, distinguished career in law enforcement where I saw daily first-hand the negative effects of Dads who weren't there to enjoy their children's passion for adventure with them. However, I saw the need for positive role models outside of sports heroes, musicians and Hollywood stars. My belief is that society could change, no matter who's home. Our motto, is "Building stronger relationships one adventure at a time". We plan events, be it bike rides, hiking trips, cook outs and even a trip or two to the local library with the little ones. It's all about getting Dads a chance to interact with other dads in the spirit of adventure, getting them physically active, alongside their kids. Encouraging interaction, passion to grow and learning something from their own kids, as I know I personally do every day. As our program grew, we began hosting bicycle safety and ride clinics, designing a portable bicycle "rodeo" course that incorporates both fun and learning on two wheels. We are constantly asked to assist local municipalities with their National Night Out programs, local Parks & Recreation programs, and more. We are always working with the local Charlotte Youth Cycling League as well as North Carolina's National Interscholastic Cycling Association that has brought both middle and high school mountain bike racing to the school systems in our state. 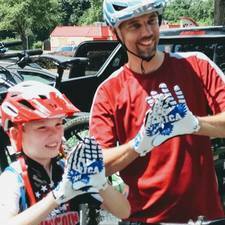 This association is part of a national organization that has over 19 states and over 12,000 students racing their mountain bikes across the nation from all walks of life. While all that is awesome, we are more than bikes! We are a program, a sports club, a group of Dads and their kids - we are here to encourage others and motivate those in physical activity, life encouragement and more. Tell us a little bit about yourself. What's your role within the group? I'm almost 40, a father of a 15 year old and a rambunctious 5 year old! I'm a native Charlotte-an, employed by the City of Charlotte for almost 18 years now, yet moved to Cabarrus County over 7 years ago, loving every minute of it as well. I hold various certifications in bicycle safety, wilderness first aid and by the time this article goes live, I'll have my Professional Mountain Bike Assoc. Instructors certificate, which is part of a International program with world wide recognition in the efforts of promoting bicycle safety, coaching and guide qualifications. I am also a small business co-owner for The Outside Chase Co., an outdoor adventure gear online and mobile business, providing biking, hiking and sports nutrition products that are unique, brand specific, some products even locally sourced. I also had the privilege to be a volunteer Program Director for the N.C. National Interscholastic Cycling Assoc. planning races, venues and daily operations for their inaugural season last spring. My role, is a labeled, "Founder", but I'm also a Dad, in need of the same motivations and effort in which our program was developed. I plan the events, I conduct all of the social media relations through the various platforms out there. I coordinate the events with local civic groups and municipalities, as well as area festivals. I maintain constant contact with my core group of area Dads, all seeking insight and bouncing ideas off each other for upcoming events. Lastly, I maintain our equipment, packing it up and hauling it around the state for the various programs were involved in. What can someone expect while attending one of Bikin' Dads' adventures? A non-judgmental, friendly and encouraging "adventure", whatever it might be for that specific outing. We attempt to advertise the event specific to a skill set, be it a family green-way ride, an all day hiking trip in the mountains, or a bike race participation. Each event is usually clearly described beforehand. Do you ever host any special events? On Fathers Day weekend we host our annual Fathers Fun Fest at Robby Gordon Motorsports, where there is a free community festival with local first responders and their tools on display. A lot of them are Dads too! There are also vendors, a car show, a stunt show by Robby Gordon and his Stadium Super Trucks, as well as live music and free food. However, we aim to always host one or two group events a month with various types of adventures. Personally, I love being with my own kids and watching them grow and learn. At our most recent event, a bicycle ride clue hunt, I observed Dads with their kids all working together as a team. I created various clues and placed them throughout the green-way. It was great seeing them working together to solve the solution. If only this simple game could transpose to others in today's society, the world would be a much better place. Plus, we were able to knock out 14 casual miles on the bike, which of course is the physical activity that many of us need! What's one of your most memorable moments while working there? Honestly, there are many! 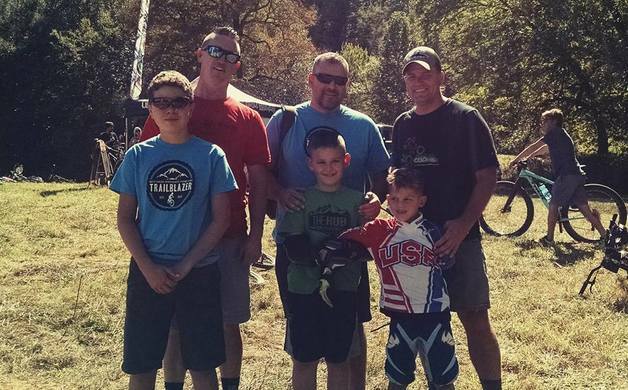 From last year's local Winter Short Track MTB races out of 65 teams, our crew came out 4th in point standings, to seeing the smiles on the kids faces at the local bicycle rodeos we conducted at various programs, all are great. One I personally recall was last year when we were asked by the national program Interbike to host the Youth Bicycle Rodeo & Skills Clinic at Charlotte's inaugural Outerbike. There our program was exposed to over 20,000 people and, well, the best part was that hundreds of kids were able to come through our little course over a few days' time at the US Whitewater Center. I heard there is a fundraiser happening right now! Can you tell us a little bit more about it? We are totally self funded and have operated of off donations since Bikin' Dads' inception. However, with the demands of our travels and the constant use of our equipment, the growth of the overall core group has taken various tolls both financially on myself and the gear we use. We reached out to the great group Red Basket Inc, a nonprofit organization that helps the "little guys" such as ours, seek assistance through their crowd funding programs. All donations are 100% tax deductible and our program receives 100% of the funds raised, unlike other concepts out there. While it's a great program, the application process is a doozy, but thankfully Red Basket has been supportive all the way. The campaign was for 45 days, however were at day 13 remaining as I type this. Head to https://redbasket.org/1327 which is a direct link to the fundraising campaign. It's simple to use and for a great cause. Also, we always searching for corporate sponsors. With an organization that focuses on getting outdoors and using plenty of gear, there are endless marketing and visibility opportunities as a sponsor. We are also in dire need for a "adventure van"- a passenger van that we can use to uphold to "cool Dad" standards, yet strong enough to tow our trailer across the state while we haul the core group of Dads and their kids to events. Anything else we should know about your events? We welcome all to our group. We attempt to describe the events in detail in all of our calendars, as well as on our website and social media. Keep an eye out for specific "skill" or age-appropriate events as some require more ability than others. Be sure to look for us at the local park systems or national parks. Our next scheduled event we were booked by the Gaston County Sheriff Department, assisting them at their National Night Out program. Later on, we're bringing our complete bike rodeo to assist at a fundraiser for Loaves & Fishes at a bicycle themed event titled, Tour De Turns, http://www.tourdeturns.org/ on August 26th. We are also looking into a planned trip to Sliding Rock for hiking and waterfall exploration, so stay tuned and follow along on Facebook, Twitter & Instagram or our website, www.BikinDads.com. We plan on taking our certifications and program to a somewhat different level - we are thinking about offering camp-like events or course teaching opportunities, be it skill clinics, and more. Help Bikin' Dads keep up the good work by donating here. Keep up to date with Bikin' Dads Adventures on Facebook, Twitter & Instagram or www.BikinDads.com.